‘I’m basically a compliance chap,’ says Charlie Ahmed, owner of Invergold. His company looks after the legal compliance aspects of running a bus or coach operation, making sure it stays on the right side of operational regulations. Chris Peat met Charlie at his Birmingham office to find out how this relatively new company can help save money and avoid investigations and inspections. Charlie provides what he describes as an ‘A to Z’ of compliance. It includes a full tachograph analysis service, for both digital and analogue versions that Invergold has teamed up with tachograph analysis software specialist, TruTac, to deliver. He speaks highly of the company’s TruControl analysis system, which has recently been updated. Acting on customer suggestions, new graphs, a new portal with a news reel and customer branded reports have been added. There are also many areas where critical data is presented faster and with improved graphics. Something he likes about the software is the fact it can process both domestic and European hours rules. He is also happy to offer driver licence compliance audits, assistance with submitting O licence applications and can produce weekly or monthly detailed reports for a better audit trail. The installation of administration systems to help meet DVSA standards can also be arranged. 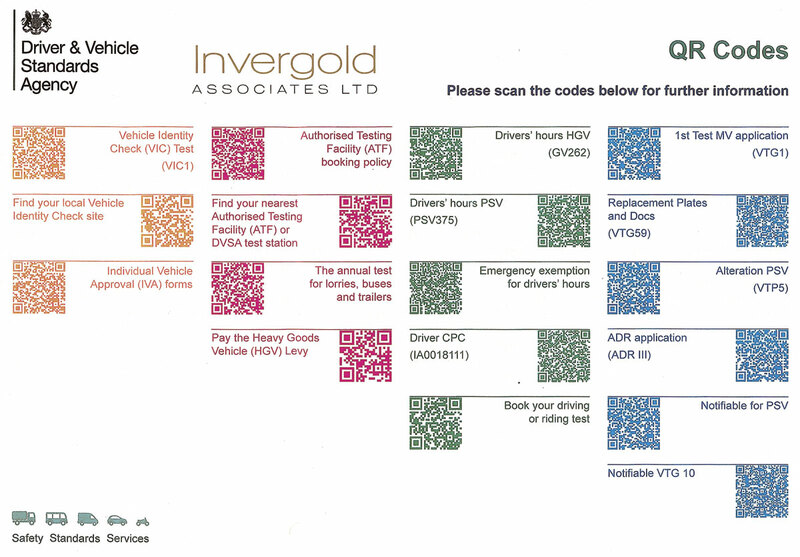 It is not just about meeting regulations; Invergold can help increase operational efficiency too. For instance, Charlie can ensure drivers’ working time is better managed. His business covers all areas of an operator’s work, from administration concerning insurance policies, to training and maintenance procedures. One important service that can be offered relates to when drivers are stopped by inspectors, ensuring they know what to do by putting in place suitable procedures. Charlie is certainly qualified to work in this sector, having been in the transport industry since 1980, with an abundance of experience in transport management roles. In recognition of his skills and knowledge in this sector he is a Chartered Fellow of the Chartered Institute of the Logistics and Transport (CILT), giving him the privilege of having FCILT attached to the end of his name. He started Invergold in February last year, but has worked in consultant management roles for many years, so this is nothing new to him. Since starting the firm with a handful of customers, the business has ‘gone from strength to strength’. ‘What some operators consider legal may not be what is legal in the eyes of the authorities’, he claims. Invergold can do an initial audit on a company to establish if they are operating on the right side of the law. If they are not, it does not mean that they are bandits, but it could lead to them getting an investigation. He aims to help them avoid this by putting right what needs to be put right. ‘You will be surprised how many people are not 100% compliant in all areas across the industry,’ he said. ‘Compared to the HGV sector, the PSV industry is not as “on the ball” in terms of compliance’. This is becoming a much more important area to focus on, as there is ‘a lot more clamping down on compliance by the DVSA’. However, with things like the introduction of Driver CPC, he believes there are a lot more steps being taken towards better conformity with regulations across the sector. Unfortunately, in his experience it is private operators who are most at risk of being caught. ‘But we can help them by analysing all their tachograph data and looking at other management procedures,’ said Charlie. It is small and medium sized enterprises like these that he specialises in serving. Charlie’s goal is to go above and beyond what is expected of him. For instance, he has produced a ‘Drivers Handbook’, which he gives to customers. It covers health and safety issues, what to cover in a driver safety check, vehicle safety, weighbridge procedures and what to do in an accident, complete with report forms, in addition to a number of other useful facts, information and advice. This isn’t all, he has also created a poster with QR codes providing access to government websites that provide information for vehicle checks and drivers’ hours. Again, these are free of charge for customers. One of the most common compliance issues in the bus and coach sector is with drivers’ hours. He believes there is not enough compliance training in place for this in the industry. Once a driver has been caught making a working time infringement, Charlie finds it is not uncommon in this sector for there to be no procedures in place to avoid the violation from happening again. This is where an external company like Invergold can help. Charlie is not the only man behind Invergold offering this, there are five associates altogether providing their expertise. The company has its head office in Birmingham and another location in Ipswich. Predominantly though, its staff are on the road visiting customers’ operations. No matter how hard you try to promote your services and how much effort is put into turning out immaculate vehicles, if the operation is not run legally it can, at worst, be taken completely off the road. Invergold’s services can be invaluable when it comes to avoiding a meeting with the Traffic Commissioner, especially for companies that struggle to find as much time as they would like to focus on keeping compliant and putting procedures in place. Employing Invergold provides a useful source of information, help and advice for every management issue.